Clever Squishy Mini Dead Zombie Brain Keychain is a smart stress reliever and a key holder is pure genius! Give the fun foam miniature brain a squeeze and feel smarter by reducing your stress. Take the brain everywhere, so work productive intelligent ideas always come to mind! Attach it to keys or purse, clip to bag or backpack, or simply hang from belt loop for instant stress relief both in and out of the office. Easily fits in the palm for discreet stress reduction. 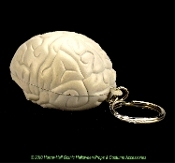 The Walking Dead theme Gray Zombie Brain Keychain can help make you feel like a true Brainiac! Polyurethane (PU) foam brain-shaped ball is non-toxic and eco-friendly. Light Gray Color.